I recently upgraded to a 2018 MacBook Pro. I’m enjoying the additional cores and memory (😀) and coming to terms with the touchbar (🤨). A low point of my first week came when I plugged into my external display, and the image looked really bad. In this post, I’ll describe what I learned and how I managed to fix it. The effect varied with typeface and application, but it was universally distracting and difficult to read. 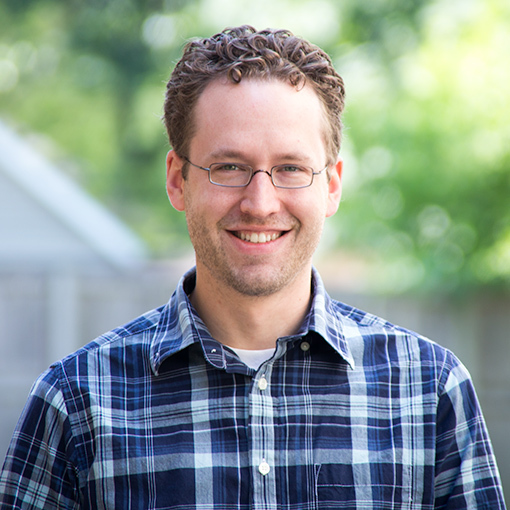 I’m aware of modern operating systems’ use of subpixel rendering, individually manipulating the red, green, and blue components of a pixel to improve text rasterization. My first hunch was that something was going wrong with this. Disabling it via LCD Font Smoothing helped somewhat, but the overall image was still noticeably worse than I had experienced before. To make sure I wasn’t crazy, I plugged in my old computer, and sure enough, it looked great! Comparing further, I couldn’t find any meaningful differences reported in software. 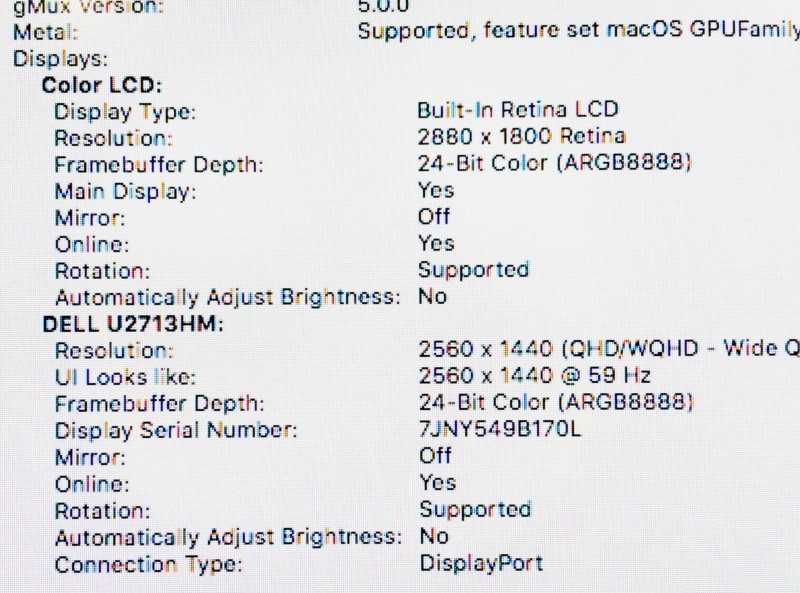 Eventually, I noticed something in the monitor’s settings: My new Mac was connecting with an Input Color Format of YPbPr, while my old Mac used RGB. I wasn’t sure whether this mattered until I started googling and found several other instances–going back several years–of users reporting poor image quality associated with this color format across various Macs and external displays. If you’ve worked with colors on computers before, you’re probably familiar with representing colors as red, green, and blue components (“RGB”). If you’ve refilled ink on a printer, you may have encountered another decomposition: cyan/magenta/yellow/black (“CMYK”). YCbCr/YPbPr is another color space, which represents colors with a black channel (“luminance”) and two different color channels (“chrominance”). The only place I’ve encountered this one before is in component video, which is (confusingly) a trio of red, green, and blue RCA-style connectors that was used for high-end home theater before HDMI was a thing. Unfortunately, I can’t just change the setting in the monitor. The menu option only seems to affect how the monitor interprets the signal it’s already receiving, rather than how the signal is negotiated in the first place. It’s also not possible to choose the color space in software on Mac OS. When a display is first connected, it identifies itself and describes its capabilities by providing a blob of bits called the Extended Display Identification Data (EDID). The Wikipedia page helpfully provides the full spec. I haven’t found a way to alter this decision. Given my Dell’s EDID, macOS will always choose YCrCb. Fortunately, macOS has a built-in mechanism to override the EDID data provided by a display. If you check out /System/Library/Displays/Contents/Resources/Overrides/, you’ll find a bunch of override files for particular displays, going way back to old beige CRTs like the AppleVision 1710 (from 1995!). So, the solution we’re approaching is to override the Dell’s configuration, to lie to the operating system and claim it’s only able to speak RGB. To do that, we’ll need to flip a few bits! Fortunately, somebody else has already solved this. We’ll need to read the display’s EDID, patch it, write a new override file, and then put that file in a protected system directory. Download and run this script (./patch-edid.rb). Take a look at the generated file and remember its path (mine was ~/Desktop/DisplayVendorID-10ac/DisplayProductID-4080 ). Reboot into recovery mode (⌘-R at boot). Mount your main disk (enter Disk Utility, select the gray Macintosh HD, click Mount, provide your password, close Disk Utility). Voila! Our override appears in System Profiler, the Dell connects with RGB, and the image quality is dramatically improved. I learned way more about how this works than I would have ever expected, but I still don’t fully understand exactly what’s going on. Perhaps Dell’s implementation of YCbCr is poor, and it shouldn’t be advertising compatibility in the first place. Maybe I shouldn’t expect to easily use a monitor that doesn’t specifically support macOS with a vendor-provided driver. Why does macOS favor YCbCr over RGB? Why isn’t control over this exposed to the user? It shouldn’t be necessary to edit protected system files to control this behavior! For now, this issue seems pretty rare (I was unable to reproduce it with colleagues’ 2017 MBPs), but it does seem likely to affect many upgrading users over the next couple of years. Hopefully, this hack helps a few of them keep using their old monitors! I can confirm that the same thing is happening on the latest generation of Dell 27″ monitors (which have a different menu design). It started happening when I upgraded from a 2017 13″ to a 2018 15″ MacBook Pro (with discrete graphics). Presumably the 13″ was also using the YCbCr color space but worked properly for some reason? Thank you for looking into this! Hopefully a driver update can be pushed from Apple at some point. How do you like the 2018’s keyboard? I frankly never minded the new keyboards – the positive clickiness makes up for the low travel for me. I wonder if the recovery mode bit could be skipped if sudo is used. Ah, I see. Too bad I guess – I was hoping to try this out on a machine I don’t have physical access to. I thought I am going mad. Talked to dell support, than Apple. Noticed color format, tried to mess with monitor settings. Glad I found this article! Thanks so much for this. I was having the same thoughts about it possibly being subpixel rendering, but had narrowed it down to something on the display side since screenshots blown up weren’t giving the same issues. I really appreciate that you documented this for the rest of us. This didn’t work on the latest 10.13.6 with a 1080p hp monitor. Any suggestions??? Oh. My. God. This worked. I was on the brink of buying a new screen. I tried this but my screen actually looked worse! I tried using the displays system prefs and calibrate with advanced options (click calibrate with alt) but this didn’t help as the tolerances were now so bad that I couldn’t get a proper brightness contrast going. I mean my screen was pretty good as it was and I thought this would give me a pure RGB to the display but I think in my case something is not right. From what I understand a true RGB signal should be such that the color settings on the display should refuse to be adjusted as the display color signal is now being driven by the computer but in my case I can still adjust saturation and such which makes believe something is not right to start with. Also, I lost the underscan and overscan features, after this change the display is being overscanned. My display is a sharp 1080p TV with an HDMI connection, High Sierra and a MacBook Air. As far as I am concerned, I am suspicious because I can control the color saturation levels and the independent RGB values on the TV itself which I don’t believe would be allowed if a true RGB signal were being sent to the TV. I wish there were a terminal command that could identify if I am indeed sending out a true RGB 4:4:4 or what. I have to investigate this further. People are reporting mixed results and I haven’t yet someone give an authoritative comment only that ‘it works’. Well, that is not too scientific for me, I just need more hard verifiable evidence because at the end of the day all I really see is a new display profile which isn’t really much. Thanks a ton for this article. It solved my problem! This was really helpful, thanks. I was worried that it was all in my head or that I needed another cable or something. It is so much better now. Thank you so much that just helped me a lot. I also have a Dell monitor. What I found out is that it could be due to the graphic drivers. My quadro k5000 shows the rgb color, my rx480 always shows the other color space yr…. in the same macpro5, but now it is solved. Just got one of the new 2018 mac mini’s and connected it up to a 4k60hz screen. I noticed immediately that clarity was sub-par on a number of os elements, especially red. It looks like the os decided to default to YCbCr 4:2:0 which is causing significant degridation of the video quality in the red side of the color space. I will have to try this trick and see if i can get similar results. The monitor does have an ‘alternate’ color space mode which does appear to force RGB (or at least only present RGB as the color space for the os), but unfortunately in that mode the refresh rate is locked at 30hz, which is far from ideal, as it is really designed for backward-compatibility with older graphics hardware. I have a new Mac Mini and am experiencing the exact same thing as you are with my 27″ 4K over HDMI. I’ve been searching for days for a answer, but so far you’re the only other person that’s noticed 4:2:2 from the new mini. I’ve posted in tonymacx86 as I’ve been a part of that community for a while. I have an eGPU on order, but really want to figure this out before then. I notice it in the edges of reds the most, just as you do. I just bought the 2018 Mac Mini, and when I started migrating my system from my 2015 rMBP, I though my eyes were playing tricks on me; on my 4K screen that was working perfectly fine with my old computer, I now saw washed out colors, blurry fonts, the whole shebang. After trying everything else I could think of in terms of hardware and software, I started googling, and found this page. I will forever be grateful to you. And while I’m at it, I’d like to take this opportunity to send a big virtual middle finger to Apple for making a critical setting like this inaccessible to end users on a $2000+ computer. Shame on you, Apple! Since writing this I upgraded to a 4k display (Dell P2715Q), and it has the same problem, though the symptoms are much less apparent at higher pixel density. Thank you very much John for documenting this. I’m in the processing of purchasing a new Mac Mini (2018) and have recently ordered a Dell 23″ IPS monitor (S2319H) that I expect to exhibit this same issue. I downloaded, installed, and successfully tested Monitor Asset Manager on my Windows 10 laptop. After changing my tv’s hdmi input type to a low quality setting and then back again it just sorted itself out somehow. Thanks a lot for the guide John Ruble. I still hate Apple though… they wasted over 5 hours of my time with this nonesense. This doesn’t seem to help w/ my Asus PA32UC in Mojave on a 2018 MacBook Pro. Any ideas? Text still looks terrible and System Report says “Television: Yes”. Tried w/ Thunderbolt 3 and DisplayPort cables. Thanks! Great post. I’ve followed each step but my Dell U2715H still is set to YPbPr. I’ve tried several times. ‘m running a Macbook Pro 2016 with Mojave. I am also struggling with these issues. Mojave 10.14.2 + Samsung LCD Monitor. Main problem is that there is no “Displays” folder in “Library” anymore, so I cant override old prefs to fix it. Quit blaming Apple for your monitor issues people. Apple’s specifications are well documented, the monitor manufacturers are failing to build in firmware that recognizes and optimizes settings for macOS hardware. So here you are fighting to get your Dell working too. what brought me to this thread is that my coworker and I have matching MBP mid-2018 and matching 1080p dell u2414h monitors. My monitor, thankfully, powers on every time when connected to my computer. whereas my coworkers Dell monitor will only auto turn on sometimes, other times they have to unplug and plug back into the macOS machine to resend the signal to power on. I had this issue for a while. I discovered that the adapter I used to connect my MacBook to external monitor (with HDMI socket) was not built to carry YPbPr color to the monitor. I got a new adapter (CableCreation was the name of manufacturer, I think) and it resolved my problem. Do you have to disable “rootless” mode for this solution? It helped with the pink\red tint issue that I had. Internet suggested to change cable, but it worked with windows running on same machine, so I knew there’s something to it.